Just to add frenzy to the already boisterous holiday period, we were blessed with the landing of a container of new French wines. Much of it originated in Bordeaux, with the bulk of our purchases from the 2015 vintage. In addition to the famous wines we offered as futures, came the arrival of a dozen or so petits chateaux wines. I mentioned a sensational deal in the world of dry white Bordeaux two weeks ago, the 2016 Château Boisson blanc. Several cases disappeared quickly, snapped up by savvy shoppers and TWH staff alike. The subject from tonight's email is a red wine from a village that's not well known for their red wines. 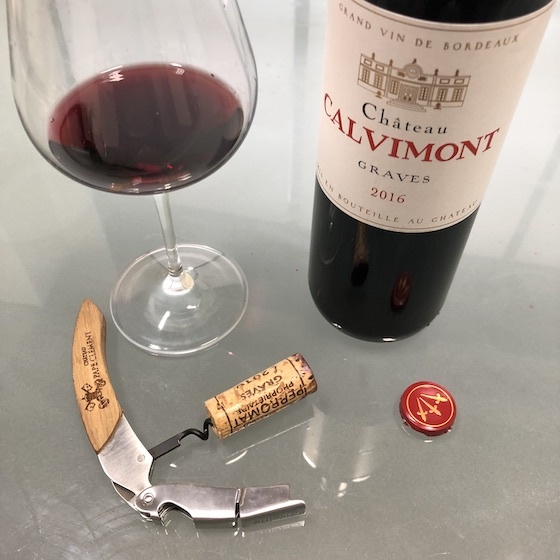 Introducing the 2016 Château Calvimont, Graves from the town of Cérons. The famous wines from Bordeaux represent a mere 5% of the overall production, which means that few have ever heard of the other 95%, myself included. Each year while in Bordeaux for the annual barrel tastings, I make time to taste wines from suppliers which have already been bottled and I must say that each year I taste wines from chateaux I've never heard of, let alone tasted before. Talk about zero label bias! It's all about quality and price in those tasting rooms, and as I re-taste this year's crop of petits chateaux wines, I must say I'm happy with the results! Early last week the stars aligned and we were all here, so I pulled a handful of these wines and brought them to the tasting room to pour for David and our staff. The wines all showed well (Phew! As the pressure was on), though one particular wine won the honors as the hit of the tasting, the 2016 Château Calvimont, Graves. A little background: Calvimont is a label owned by Château de Cérons, and the production is red and dry white wines. Dry wines coming from within appellations that produce sweet wines from this area are legally allowed to use the Graves appellation on their labels. Cérons sits right beside the Garonne River just across from Cadillac. Cérons is just south of Podensac and just north of Barsac. If you know me, you know I spend a lot of time in this neck of the woods each year. The Château de Cérons is a grand manor house built in the early 18th century situated on a terrace overlooking the Garonne. It is listed as a historical monument. It was the Marquises of Calvimont who initiated the construction of the chateau in the 18th century. The vineyards which produce Château Calvimont have always been part of the Cérons estate. The soil is gravel and sand upon limestone. The winery is gravity fed, designed for the gentlest possible handling of the grapes. For the red wine, the blend is 55% Cabernet Sauvignon and 45% Merlot. Fermentation is done in cement vats and the wine is aged in barrels, 20% new. The current management team of Xavier and Caroline Perromat took over in 2012, and things are looking up, up, up. At least I'm keeping my eye on them! So as we were tasting the wines the other day, this one stood out for its quality and modest price tag. The aromas are complex and nuanced with hints of bright red fruit, crushed leaves, geranium, some chalky mineral and that brambly, plump Merlot fruit. On the palate, it exhibits a medium-bodied entry with that 2016 freshness, the hallmark of the vintage. Its bright acidity keeps the nuanced wine alive, allowing for the complex layers to pop out to say hello. The finish is well balanced and long. All in all, for less than $20, the Château Calvimont is class act!